estate to me has been presented to you by my late cousin's attorney Barrister Muzali Mustapha who is also my attorney on the same subject. In view of this i will like to know the institutions requirement, time and procedure for the transfer of the inherited estate to me. Your urgent response will be highly appreciated. 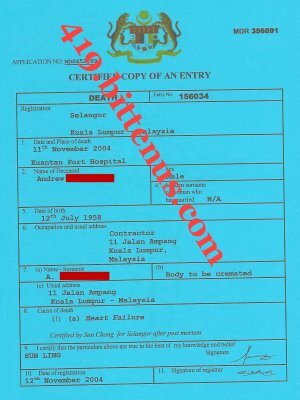 After a long procedures i went through, i was at last able to process the documents needed. 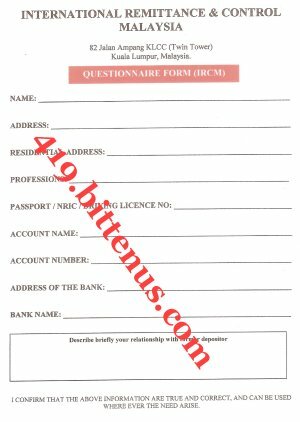 Attached to this mail is the remittance and control certificate questionnaire form, this is needed to approve the transfer to your nominated account. Fill the form carefully, include all the information needed for the transfer to your nominated account and return it to me as soon as possible. Also attached is the death certificate and notification letter from the office of the Attorney General, the legal documents were dated the day of approval as required bylaw. Note that All these documents cost me alot regardless of the non official expenses but nevertheless all am counting on is your honesty towards this transaction. The remittance and control certificate is the last document needed for us to approach the bank for you to instruct the transfer. Everything worked out fine and all the supporting documents I presented were accepted and gazetted as you can see from the Attorneys General Notification. As the situation is, we will definitely have the fund transfered in less than 7 days. The Foreign Payment/ Tax will cost �9,400.00 which am arranging how i will pay for at Inland Revenue hopefully by tomorrow. I urge you to call me immediately you receive this email for further explanation. 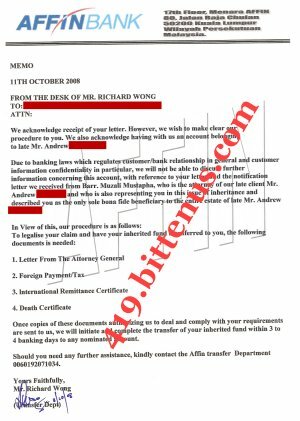 The remittance and control certificate is the last document needed for you to instruct the Bank to transfer the said fund to your account.You can call me on my direct line if you are having problems filling the remittance and control form.